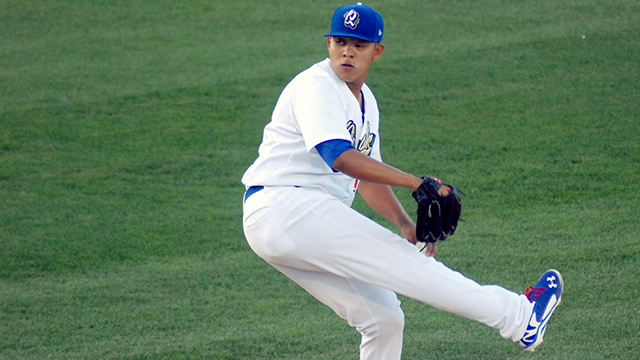 Rancho Cucamonga, CA - The Quakes got a fantastic outing from Julio Urias, but the bullpen gave up six runs in a 6-1 loss to the Lake Elsinore Storm in the series finale on Monday night. The Quakes scored first in all four games of the series, but lost three of the contests. Julio Urias entered in the third inning for Rancho Cucamonga (29-28, 61-66) after Dodgers' pitcher Chris Perez made a rehab start for the Quakes. Perez pitched a scoreless first inning, striking out Benji Gonzalez to cap it off. After Geoff Brown pitched the second, the 18-year-old Urias entered in the third. He had two walks and hit two batters in his first two innings of work, but he managed to keep the Storm off the board. With the bases loaded in the fourth, Urias retired the final two men he faced. He was perfect over his next three innings, setting down the final 11 men he faced. Urias tied a career-high with nine strikeouts and he walked just two in five scoreless innings. Since July 9, Urias has given up just three earned runs in 26 innings of work, striking out 41 and walking 10 batters over that span. His overall ERA was lowered to 2.68 with Monday's start. Urias was in line for the win thanks to a Chris Jacobs home run in the fourth inning that put Rancho up 1-0. It was the second home run in as many nights for Jacobs, who leads the team with 23 long balls. Jacobs provided the only run of the game for the Quakes. Lake Elsinore starter Elliot Morris struck out eight and gave up only four hits in six innings. Rancho was 0-for-8 with runners in scoring position. Lake Elsinore (29-28, 69-58) broke up Rancho's shutout bid in a big way with five runs off of Craig Stem (0-2, 4.88) in the eighth inning. Benji Gonzalez tied the game at one with an RBI single, and it looked like the damage would be done there. Stem struck out Alberth Martinez with two outs, but a wild pitch allowed Martinez to reach safely and the inning continued. A bases-loaded walk, a two run single and an RBI double with two outs put the Storm up 5-1. Nine men came to the plate before Yasmanys Fernandez was brought in to relieve Craig Stem. Fernandez got out of the eighth, but gave up a run on two hits in the ninth. The Quakes dropped three of four to Lake Elsinore in the series, falling to 3-11 versus the Storm at LoanMart Field this year. With the loss, Rancho shares first place in the South Divison with both Inland Empire and Lake Elsinore. Lancaster sits a game back, and High Desert has two games to make up with 13 to play. Rancho hits the road on Tuesday for three games against the Visalia Rawhide. Jharel Cotton (5-9, 4.38), who has gone seven innings and given up two earned runs or fewer in his last five starts, gets the ball for Rancho against Andrew Barbosa (4-2, 4.24). First pitch from Recreation Ballpark is at 7:00 pm and the game will be broadcast live on Fox Sports AM 1350 starting with the LoanMart Pregame Report at 6:45 pm. Rancho returns home for a six-game home stand on Friday, August 22. The Quakes begin a three-game set against the Stockton Ports with a Family RV $1 Family Feast Night! Hot dogs, Pepsi Products and ice cream sandwiches are all just $1 at LoanMart Field. On Saturday, fans will enjoy a postgame Fireworks Spectacular thanks to National CORE! On Sunday, the first 1,500 fans will receive a picture of LoanMart Field thanks to Dignity Health as part of our fan photo series! The first two contests start at 7:05 pm, while Sunday's game gets underway at 5:05. Tickets are still available by calling (909) 481-5000 or online at rcquakes.com. We hope to see you at LoanMart Field this weekend! Go Quakes!